I’m a very new woodworker needing help with identifying this wood. This is the lower table on a 2 tiered rotating coffee table. The rotating mechanism is stamped Heywood Wakefield. My mother refinished it around 1959, as you can see it needs help after time in a leaking storage unit. Any knowledge shared is greatly appreciated. 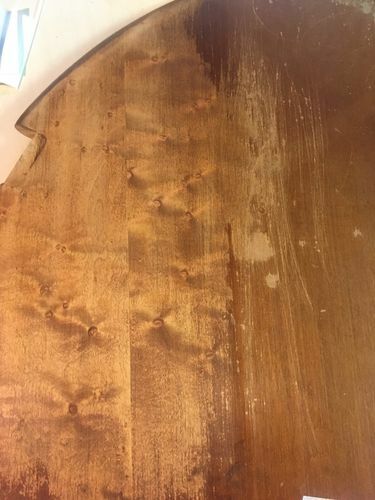 It’s really hard to tell from one picture from one angle of a stained piece, but it does not look like maple to me. Could be either based on that picture. Are you just curious or do you need to know for some reason? I am 60% confident it is Maple. Even a blind squirrel gets a nut every now and then :) my first thoughts were cherry but that’s heretical. Really just curious, I thought it was maple but read that Heywood Wakefield switched to birch in 1940. I don’t think the piece is that old. I may have been wrong about the age of my table. 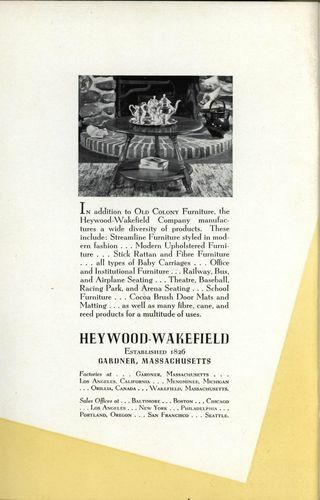 Just found a great picture of it in a 1937 Heywood Wakefield trade catalog. The introduction to the catalog states most of the Colonial line was Yellow Birch with some in maple. Looks like maple to me, too.